The Great Meadow Conservation Area consists primarily of wooded marsh and features abundant wildlife habitat for fish, birds, and mammals. Humans can enjoy a family-friendly 1.3 mile trail loop with scenic views of meadow and marsh wildlife habitat. The opportunities to hike, bird watch, horseback ride, and enjoy this remarkable section of town are an important piece in the quality of life we take pride in as a community. The Massachusetts Natural Heritage and Endangered Species Programs designated this property as a Core Habitat area for aquatic, plant, and wildlife as well as an Area of Critical Environmental Concern (ACEC). Grafton's 2007 Open Space and Recreation Plan also designated this property as priority area for conservation. Grafton’s water supply is under ever-increasing pressure. The town's Frost-Blithewood, Great Meadow, and Great Meadow Gateway parcels are further enhanced by the Land Trust's Nicholson Family Preserve abutting to the west and conserving nearly 200 acres the of Miscoe Brook Watershed and ACEC. Additional benefits beyond clean drinking water include conserving more of the eastern wildlife corridor near the Henessey property to the north and the Pell Farm CR property to the southeast. 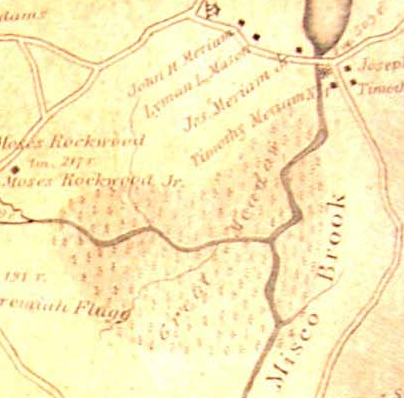 There is a folk story in Grafton maintaining that the true location of John Eliot's Shelter Rock is not off of North Street, but instead is the small outcropping of rocks a dozen feet from the north edge of the meadow on the Great Meadow Connector property. The synopsis of the Shelter Rock story is: "John Eliot reputed to have taken shelter here when he first visited Hassanamesit." Either way, it's fun to see the rocks and imagine some true hide-and-seek.